Two men come to a river and look for a place to cross. The current is very strong and they are both afraid to cross it. A third man comes along and sees their difficulty. He leads them up the river to a place where there are some stepping stones and a small island in the middle of the river. He urges the men to step on the stones but both are afraid, so he agrees to take one of them on his back. By the time when he gets to the middle of the river, the man on his back seems very heavy, so he puts him on the little island. He then returns to fetch the second man who wants to climb on his back as well. But the third man refuses. Instead he takes his hand and encourages him to use the stepping stones himself. Halfway across, the second man starts to manage alone and drops the third mans hand. They both cross the river. When the two of them get to the other side, they are extremely pleased with themselves and they walk off together, completely forgetting about the first man, sitting alone on the island. He tries to get their attention, but they do not notice his gestures for help. The mime was understood on a number of levels. There was a recognition of the symbolism of requiring help to reach goals, but not becoming fully dependent, of the importance of individual self-reliance in the context of development assistance, and of the divide between the developed and the developing. This session deals with the concept of participation. It addresses questions such as: What does it mean? Why has it been developed? What is it based on? What is new about it? Does this concept fit the context of the pastoral areas of the Middle East? A. Brainstorming: What is participation? Divide your trainees into small groups of 3-4. Hand out small cards to each groups and ask to brainstorm together and come up with meanings for the term participation. Ask them to write these down on the cards. Collect the cards and group or cluster them under similar topics. Try to find major headings for each group or cluster. The debriefing of this activity can be combined with the debriefing of the next few steps over several sessions. This was found to be a very successful approach in the Syria workshops. Provide a summary on the history of participation, based on the information given below. Adjust the level of sophistication of the presentation to the level of knowledge and awareness of participation among the trainees. Distribute handouts only after the presentation. To do so before will only distract the trainees. Participatory approaches are a product of long lasting interaction between researchers, development workers, government agents and local populations. The history of participatory methods in development co-operation began in the late 1970s with the introduction of a new research approach called "Rapid Rural Appraisal (RRA)", which immediately became popular with decision-makers in development agencies. Building on close collaboration with local populations RRAs were designed to collect first-hand data from the local people about their perceptions of their local environments and living conditions in rural areas. RRAs were usually conducted as 1-3 days workshops with villagers in the field and facilitated by small teams of RRA specialists or researchers. RRA methods were specifically adapted to respond to local conditions. Thus communication processes with illiterate persons not used to communication in abstract terms were carefully considered. Visualisation using locally comprehensible symbols, and tools like mapping, diagramming and ranking were introduced. A limitation of RRA, however, was that it was extractive; the role of the local people was limited to providing information, while the power of decision-making about the use of this information remained in the hands of others. During the 1980's NGOs operating at grass-roots level used RRA to come up with further fine-tuned approaches called Participatory Rural Appraisals (PRA). PRAs use similar methods and tools as RRA, but the underlying philosophy and purpose changed. While RRAs aim at extracting information, often in a single event, PRAs were designed to follow more the peoples own concerns and interests; PRA workshops were usually facilitated by a team of trained persons and could take several days (3-6). One of the most important principles in PRA was the sharing of results of analysis, decisions and planning efforts among the community members by open and public presentation during meetings. PRAs strongly supported and facilitated the introduction of more demand-responsive ways of managing development interaction, and process-oriented thinking. The latter led to sequential applications of PRA events and assisted follow-up. Thus it built up rural people's own capacities for analysing their circumstances of living, their potentials and their problems in order to actively decide on changes. PRA facilitators accepted more and more the role of learners. These shifts towards interactive mutual learning was then reflected in the new terminology of Participatory Learning and Action (PLA) in the early 1990s. Since the beginning of the 1990s extended concepts OF PARTICIPATORY PROCESSES and INTERACTION have been developed, and summarised under the name Participatory and Integrated Development (PID). In order to overcome the casual application of participatory methods here and there, PID seeks to include workshops and their results in a broader, long-term frame of institutionalised activities. PID means offering facilitation support to locals (such as villages, communities, interest groups, associations etc.) on a demand responsive basis, and assisting them in getting their interests represented. For example, getting grassroots level planning and action integrated into local and regional planning approaches. This leads to a more sustainable and better co-ordinated way of development. In addition to this vertical integration, PID also trys to enhance horizontal integration, i.e. the collaboration of different agencies, sector organisations and different groups of stakeholders within a region. The full text above may not necessary be handed out to all trainees. You may wish to hand it out only if related questions arise. Ask training participants about their experiences, if any, with changing development approaches and the emerging use of participation during their working careers, and list answers on a flip chart. Palmyra Input: "What is participation"
leads to increased sharing of benefits and decision-making power in the development context. materialises in that people or groups of people access skills to analyse their living conditions, to plan for themselves and that they are enabled to act. is not an end in itself, and should not be seen in isolation. Most often, the increase of participation is a powerful catalyst towards achieving other objectives, such as improved management of natural resources. D. Input and plenary discussion: What can participation achieve? Prior to opening a plenary discussion on trainees perception of the advantages of participation, present a crisp synthesis of what you consider important about the basic objectives and value of participation. Palmyra Experience: Trainees working on "Participation"
On the whole these responses suggested an awareness of the broad definition of participation. However, the specialist meaning of participatory approaches to research or PRA was generally novel to the workshop participants. Create your own pre-prepared flipchart, on which you then can make comparisons of the results from this exercise. Let participants compare the brainstorming exercise results with the trainers' presentation. Encourage them to discuss the best term in Arabic to define the word participation and to agree to use that term throughout the workshop. When talking about participatory approaches and methods today, we are not talking about a fashion or a vogue. We are discussing field-tested approaches developed on the basis of scientific evidence and practical experience. These approaches have been fine-tuned and further developed in response to changing demands from local people, governments, development workers and researches. The implementation of participatory approaches requires flexibility and process-orientation. Participatory approaches will continue to develop and be modified. Participation puts people in the centre and promotes collaboration for mutually defined objectives. Many factors influence the degree to which participation is evident. The conditions under which participation flourishes differs from place to place. The following parameters may be important in determining the degree and extent to which participation is present in any one context. Together with the workshop participants modify this tentative list to fit local circumstances. It is self-evident that there are, everywhere, different levels of participation. It is important to be aware of the different connotations, intensities and levels attached to participation when talking about it. Does participation describe the same phenomena everywhere? Can we distinguish between degrees or levels of participation? What is our own knowledge and experience with participation? In order to reach a common understanding of the different levels of participation, we recommend that you start with a group exercise collecting different views. Invite your trainees to describe in one sentence 3 different qualities or levels of participation they can think of from their own experience. Let them write these ideas down on on cards. Collect the cards, and ask 2 participants to separate, them with the help of the whole group, into what they consider different "levels" of participation; try to find appropriate headings for each cluster of cards. Be aware of the fact, that any written exercises in Arabic can be problematic. Even literate, educated people may feel unsure of their skills in the classical language, rather than the informal spoken dialect. At this point introduce Pretty's Typology of Participation and compare it to the group's findings. The table gives a description of different levels of participation. People participate by being told what is going to happen or has already happened. It is a unilateral announcement by an administration or project management without any listening to people's responses. The information being shared belongs only to external professionals. People participate by answering questions posed by extractive researchers using questionnaire surveys or such similar approaches. People do not have the opportunity to influence proceedings, as the findings of the research are neither shared nor checked for accuracy. People participate by being consulted, and external agents listen to views. These external agents define both problems and solutions, and may modify these in the light of people's responses. Such a consultative process does not concede any share in decision making, and professionals are under no obligation to take on board people's views. People participate by providing resources such as labour, in return for food, cash or other material incentives. Much on farm research falls in this category, as farmers provide the fields but are not involved in experimentation or the process of learning. It is very common to see this called participation yet people have no stake in prolonging activities when incentives end. People participate by forming groups to meet predetermined objectives related to the project, which can involve the development or promotion of externally initiated social organisation. Such involvement tends not to be at early stages of project cycles or planning, but rather after major decisions have already been made. These institutions tend to be dependent on external initiators and facilitators, but may become self-dependent. People participate in joint analysis, which leads to action plans and the formation of new local institutions or the strengthening of existing ones. It tends to involve interdisciplinary methodologies that seek multiple objectives and make use of systematic and structured learning processes. These groups take control/ownership over local decisions, and so people have a stake in maintaining structures or practices. People participate by taking initiatives independent of external institutions to change systems. Such self-initiated mobilisation and collective action may or may not challenge existing inequitable distributions of wealth and power. Note well: It is important to localise the point of departure before introducing any kind of participatory processes. This is the entry point for designing meaningful interventions and development strategies. It is important to consider at this time: What do we want to achieve? What speed and intensity of change can we realistically expect? We need to keep in mind that over-ambitious targets may be counterproductive. Ask workshop participants to place their own working context within this Typology of Participation and to explain why they have made this choice. Ask them also which level they would aspire to reach, and which level they consider as being most conducive for collaborative management of natural resources in their working context. This kind of local placement is valid also for the specific training context: Where do we start? What do training participants already know? What does a workshop want to reach? Divide participants into groups and let each group create a list of advantages and disadvantages of one selected level of participation, applying it to the context of natural resources management in, for example, dry rangeland, farmland, natural reserves. Discuss the exercise results within the plenary and discuss together which level(s) of participation would be most conducive for collaborative natural resources management. What is realistic in the given context of their work? · When talking about the introduction of participatory approaches it is important to keep in mind that there are different points of departure as well as destinations: be realistic; define context specific and appropriate objectives when aiming at increased participation. · All types/levels of participation have something in common: They all seek to capture and build on peoples knowledge and aim towards improving development support for people. · The achievement of the highest levels of participation require a democratic policy framework and decentralisation. · The higher the level of participation the more space is given to people in decision-making. · Increasing levels of participation promote local people as the main actors and implementers of their own development. This involves, however, that they accept the responsibilities as well. · With increasing levels of participation, the role of external agents shifts more and more from actors to facilitators. · The higher the level of participation the more knowledge, skills and capacities are required by the local people. This session introduces a number of key principles in the application of participatory methods and tools. These principles are important because they enhance a positive process while discouraging the manipulative or unparticipatory application of methods and tools. Key Principle "Leading to action and debate about change"
Brief introduction of the key principle "Iterative action/process"
Key principle "Flexibility in applying instruments"
A. Game: Key Principle "Exchanging Ideas leads to Debate and Action"
Ask your trainees what they feel about the temperature in the working room (or soft-drinks, or food, or sitting arrangement. Think of any topic which is closely connected with the workshop situation and where you suppose that the arrangements do not make all the participants happy). Ask this question and invite them to discuss about it. Most probably, there will be one or two persons who are not happy about the present arrangement. Then pose the question, "what can be done about this". There will be further discussion and proposals for change which the group may or may not adopt. Draw participants' attention to the fact that as soon as people were encouraged to give their opinion on a certain topic, they became active, talked about it and - depending on the needs of the group - either decided on a change or on maintaining the present situation. Since participatory processes encourage free expression of opinions and needs, they lead to debates about changes in existing condition. This contributes to changes in the perceptions of the group and their readiness to contemplate action. The process of common analysis and dialogue helps to identify compromises between different interest groups. It also helps to define desired changes and to motivate people to implement them. Start this game out of context without mentioning that it is connected in some way with the workshop topic. Let the group come to realize that during the course of the debriefing. B. Input: Key principle "Iterative Process"
Give a very brief presentation on what is meant by the key principle "Iterative Process". You may find the following useful for a short presentation. Participation is an iterative process which develops and occurs over a significant period of time. The concept of participation cannot be developed or implemented over night or within the course of one workshop. just as a relationship between different interest groups cannot change over night. Participation is a process which requires patience and commitment from all. It is a process which requires courage in order to recognise and admit when things go wrong. In the participatory process it is important to revisit agreements and decisions periodically to adjust them for changes which might have occurred in the respective situation or conditions of the various groups. C. Eye Openers: Key Principle "Multiple Perspective"
Use the "Bird-Rabbit", or the "Young Lady - Old Lady" eye-openers (see Background materials) to introduce the key principle "Multiple Perspective".. These are simple examples of how a persons perception changes with the different perspectives. Participants are shown the drawing horizontally/from one side and are asked what they see. Everybody will see the bird/the young lady. Even when the trainer asks the group to look again and confirm their view, most will probably answer the same. As soon as the drawing is turned to a vertical/opposite position, participants will soon see another image, the rabbit/the old lady. - how the perception of certain things within the project changes when it is looked at from the perspective of a Bedouin, a settled farmer, a government worker, etc. - only a combination of many different perspectives reveals a picture which comes close to reality. Like a mosaic, life issues reveal themselves only once a number of different little stones are put together. D. Input: Key Principle "Flexibility in applying instruments"
Provide a very brief introduction to the key principle "Flexibility in applying instruments". Emphasise that there is no recipe or blueprint for facilitating participatory processes. Methods and tools should not be used mechanically but should be context specific and appropriate to address the question or topic under discussion. The selection of a particular tool or procedure should be also determined by the specific characteristics of the group the team is working with. (This topic will be addressed again in session 8 and 9). E. Game: Key principle "Visual Sharing"
Choose two topics (ie. leadership or protecting wildlife). Create a list of 10 characteristics for each concept or topic. Prepare a visual aid for only the second topic, including a numbered list of characteristics. Send two volunteers out of the room. Ask the trainees to pay attention and then read out the first topic (for which there is no visual aid) plus the numbered list of statements. After number 5 call in the first volunteer and read the rest of the list. Afterwards ask the trainees to choose the number of the statement they agree with most. Most people will probably ask you to repeat the points and the volunteer will probably be completely lost. Go to the second topic and pin up the visual aid, read it out as before, calling in the second volunteer after statement number 5, and read the rest of the list. When you have finished ask the trainees to choose the number of the statement they agreed with the most. - which task was easier, and why? - what were the differences for the volunteers? - what can we learn from this for our work? At this stage of the workshop, you should introduce "Visualisation in Participatory Processes" (VIPP), its advantages and the VIPP-rules (see below). VIPP promotes the visible representation of ideas/topics while they are being discussed or presented. The visual aids should be made with materials which are locally available and done in such a way as to allow everyone to follow the discussion (e.g. drawings on paper/ground board; symbols/objects placed in front of people; writing on paper/ground/board). use different colours and materials when creating visual aids. F. Input: Key principle "Group Learning"
Prepare a presentation on the key principle "Group Learning". You might benefit by refering back to the material on the key principle "Multiple Perspective". Emphasise that participatory workshops and other participatory processes are best done conducted in groups and facilitated by interdisciplinary teams. This is a distinct advantage, since the complexity of most situations can only be revealed through multiple perspectives. Numerous expert opinions can emerge through group analysis and interaction. G. Eye-Opener: Key Principle "Self-critical Awareness"
Present the eye-opener "The Hs and the Ks"/"The Saba'as and the Thamaniyas" (see Background material) to introduce the key principle of "Self-critical Awareness". This eye-opener is designed to demonstrate how recent events create new perspectives and how other people's inputs broaden one's view and influence the interpretation of the things one sees. Show the first diagram (with Ks/Saba'as) to the participants and ask them what they see. Most participants will take some time before discovering the two K's/Saba'as. If after a decent interval there is no response, you might have to show them. Next present the diagram with the H's/Thamaniyas. Very likely, they will discover the Hs/Thamaniyas immediately. Emphasise facilitators have to be extremely careful to constantly analyse their own biases. This means even facilitators need to constantly reflect upon whether the things they feel they have perceived were actually heard and observed or whether they have already pre-judged or interpreted. Divide participants into 7 groups. Give each group responsibility for one key principle. Then ask the groups to identify situations and contexts, where their key principle has, or should have, special implications (in this case, where respecting this key principle would be helpful in co-managing the natural resources of the project region). - facilitators (project team) have to be careful not to behave in a superior way towards the Bedouins. To do so would lose their trust and may even result in a refusal to continue to work together. Participatory Methods and Tools are not "participatory" by themselves. Only when they are used and applied by persons whose attitudes and behaviour encourage and enhance mutuality and sharing can such tools and methods be called participatory. Divide participants into 2 groups. Ask one group to work on encouraging and the other on discouraging situations. Invite all members of both groups to think of any kind of different situations in their lives, where they felt encouraged/discouraged to take part in a certain activity. Each group member should try to think of at least one situation. Jog their memory by giving them some examples (child wanting to play with bigger children, certain school situations, situations in the family, situations at work, discussions on topics where they felt they were expert or were not informed). Encourage them to share some of these stories amongst each others within their respective group. Ask them to analyse which attitudes/behaviours of other people encouraged/discouraged participation. Discuss the results with all the participants and using a flipchart draw up a list synthesising the encouraging and discouraging attitudes and behaviours for participation. Prepare a presentation on positive attitudes and behaviours for participatory processes (see below). Generally speaking, participation is a collective action aimed at achieving a common objective- it means "taking part" and "getting involved". The main task of the facilitator is therefore to encourage, prepare and involve people in a process or activity. In a participatory process, persons or groups share knowledge, ideas, opinions, votes, materials, resources, labour, finances in order to reach a common agreement or to make joint decisions in a transparent way. There are different levels of participation (see session 3, Typology of Participation), ranging from passive participation (where people are involved merely by providing information to others or by being told what is going to happen) to active participation and self-mobilisation where people take initiatives independently. Empowerment describes a progressive process of participation that enables local groups to take initiative and work actively in the interest of the community. This goes far beyond simply widening access to decision making. It implies making people understand the reality of their situation, reflect on the factors that influence the situation, and - most critically - take steps to effect changes to improve it. When applying or implementing participatory approaches, it is important to know how a particular technique is applied. But it is also important to understand the key principles that lie behind the technique (see session 4 Key principles) and which attitudes and behaviours are fundamental to a participatory process. The following list identifies a number of attitudes which are particularly conducive to participatory processes. A basic fact neglected by many is that different individuals and groups have different perceptions and thus assess situations differently. This leads them to different conclusions and actions (see Session 4 Key principle "Multiple Perspective"). Everyones view of situations is heavily laden with perception, interpretation, bias and prejudice. This suggests that everywhere there exists multiple descriptions and interpretations of real world phenomena, events and actions. Accepting this phenomenon leads to a fundamental understanding for all participatory processes. Everyone is different. Everyone perceives different realities and therefore offers important contributions to a process. The different views of people can complement each other. Where everybody thinks the same, there is not much thinking!!! Facilitators and promoters as well as other people involved in participatory processes should adopt a learning attitude which makes them open to adopt new ideas from the persons/groups they are working with. This is preferable to the more common teaching or preaching attitude which suggests the feeling of "knowing it better". This "learning attitude" can be enhanced by acknowledging and respecting the opinion and experience of others. This requires recognising local expertise and the special knowledge they have of their own living conditions. Thus the role of a facilitator is to enhance the involvement of all interested parties in all processes such as investigations, analyses and evaluations of problems, constraints and opportunities, and the taking of informed and timely decisions. Participatory decision-making requires readiness from all sides to reach a "win-win" compromise. An atmosphere of mutual trust is the basis for compromise. Constructive co-operation and transparency by all stakeholders is a basic requirement. Transparency will avoid hidden agendas and suspicion amongst different parties and thus prevent situations in which all parties try to protect their own interests rather than finding the most suitable compromise. Being open to other peoples ideas and opinions is the most difficult aspect of participatory processes. Their views often may be difficult to understand and contradictory or incompatible with one's own ideas and beliefs. Accepting this reality requires a great deal of flexibility as well as courage to set aside ones own perception. Furthermore it requires an attitude of objectivity to follow the process through and, be ready to rethink and re-plan at any stage. A positive working style encourages an openness to actively listen to other points of view and sharing of opinions without taking reactive or reactionary positions. It is the opposite of hierarchical and authoritarian working approaches. It is also more structured and directed than a totally wide open, anything goes attitude. It is working together. Let the group observe all three working styles and then comment on which one seemed most conducive to participatory approaches. If acted out correctly, they will all identify the latter (open-minded and transparent) as the most positive of the working style. When giving the information above in whatever form, include also the instructions for the game "Chinese Whisper". Invite participants to have a look back over the key principles and attitudes and behaviour which encourages or discourages participatory processes. Encourage them to create a set of simple Do- and Don't rules for their own behaviour, when facilitating or taking part in a participatory process. Ask each person to create their own list of Dos and Donts. Then invite participants to share their list with the rest of the group. Working with a flip chart, if possible, try to come to a commonly agreed list which the group is ready to adopt for the duration of the workshop and beyond. · give everyone a chance to talk: "Pass the stick"
"Chinese Whisper" is a game which helps participants become aware of the difficulties in communication. It demonstrates how important it is to pass information clearly and with transparency. To conduct the game, invite your participants to sit in a large circle. Then whisper a small message, consisting of 1-3 sentences into the ear of one person, who then has to whisper the same words to the person sitting next to her/him. That person, again, has to pass the message to his/her neighbour and so on. In this way, the message passes around the circle until "the whisper" reaches the last person, who has to say out loud what he/she has heard. During the game no one is allowed to ask questions and no one is allowed to repeat the message, even if the following person did not hear it well. of the initial message, how much was lost in each transmission? How much was added in each version? What errors or differences were observed as the message passed among the group members? How could we have increased both the facts and the understanding of the messsage? How do we get feedback in real world incidents? · "We have heard that the camels grazing near Resafe have become ill because of some poisonous plants. We have heard also that the government is going to prevent any herders, even sheep herders, from entering the region because there is no antidote for the poison". · "There are some camels near Palmyra". The special interest in this game was to reveal the difficulties of communications and to show the way in which rumours often get started. We realised that for the participants, in addition, there was the concern to discover where the story got distorted, and who was to blame for the distortion. Beside the lessons to be learned about communicating from this exercise, it also served as an ice breaker and helped to bring even the more reticent member of the group into fuller participation. This session introduces a basic guideline for teamwork. It also presents a technique which improves individuals performance in a team and, at the same time, avoids friction within a group. It is tempting to start by providing a package of information on teamwork. However, it makes more sense to begin with some discussion on the steps necessary for working on tasks in a team. Once this is has been established, the first group exercise can be undertaken. Hold a plenary session, brainstorming the advantages and difficulties they have experienced or observed when working in a team. Collect all ideas on cards, collate them and find headings for each group. Put the headings and findings on a flipchart. Probe with further questions, if necessary, to come up with some of the following problems: loss of time in extended discussions, different opinions on how to proceed, confusion due to people discussing different topics at different levels, dominant persons shouting down quieter ones participants. Review the flip chart and look at the advantages presented by the trainees (add more if necessary). Point out that these advantages are good arguments for solving certain tasks in a team. Refer back to the key principles "multiple perspective" and "group learning" (see session 4). Then announce, that the following presentation will provide an approach to solve some of the problems identified in teamwork. B. Input: "Working on tasks in a team"
Begin your presentation by emphasising the importance of teamwork. Remind your participants that most activities in participatory processes are collaborative. Even facilitation is ideally conducted by a team. Team-working skills are a vital component of any participatory process. Prepare a handout and make an oral presentation on "Working on tasks in a team" (see below). Decide upon which roles could be helpful in connection with the task to fulfil. However during training workshops encourage participants to alternate all roles for each exercise, in order to experience as many roles roles as possible. Define the task to be achieved and read it out loud. Discuss with the team whether the task is clear to everybody and come to a common understanding. Discuss jointly which working steps are necessary in order to achieve the task and write out the steps on flip chart. Look at the working steps together and decide whether some of the steps could be done in sub-groups simultaneously in order to save time; if so, decide together who wants to work on which step/sub-task. Study the working steps and the timeframe you have to achieve your task. Try to estimate how much time the respective working steps might need and what percentage of the entire timeframe you want to dedicate to each step. Dedicate at least 5 minutes for a flashlight-round. Write out the timetable. Begin working on the task, following the steps and timeframe you have decided upon beforehand. At the end of your working session, sit together and talk about the process of working together. How did the team members feel about it? Was it a positive experience? Was there anything disappointing or discouraging factors.. Invite questions and criticisms about your presentation "Working on tasks in a team". Then try find solutions to those problem which came up during the brainstorming session but were not covered by this teamwork approach. Write up the contribution and put it up on the wall of the workshop room. Encourage participants to refer to this approach from now on for any group exercise. Emphasise that these working steps should be strictly followed during the training workshop in order to get practice in all of the steps. They are not, however, meant to be a blueprint. They should be regarded as a strategy which should be handled flexibly and be adapted to the respective task and situation. C. Exercise: Rotating group-exercise on "Roles in a PRA-team"
Hand out pre-prepared charts (see Background Materials) with a field for tasks and one for characteristics/attitudes for each of the roles to be discussed. Explain that when working in a community as a PRA/PLA-team, the roles required will be slightly different than for teams working on a task on their own. Give the participants pointers as to which roles should be covered. (see below). Divide participants into groups, distribute a chart to each group and ask them to elaborate on the roles of a team, which is organising a PRA/PLA-workshop (team-leader, facilitator, note-taker, link-person). After 20 minutes ask the groups to exchange their charts and then again after 15 and after 10 minutes, until each group has worked on all the charts. Have all the charts presented in a plenary session so that they can be shared by everyone. The team leader is the person who is responsible for the teams activities from the beginning of the planning to the end of the evaluation process. - co-operates closely with local leaders and the representative of the organising agency to ensure that all the organisational and logistical matters are settled. - suggests the distribution of roles in the team in accordance with professional background, skills and gender. - introduces the team and the suggested working procedure to the local community. - keeps an overview and co-ordinates all ongoing activities. - makes sure that all team members achieve their roles and assists them if they have problems. The note-taker works closely together with the facilitator. The note-taker is the person who collects and documents all relevant information during a working session with local groups. The link person is a representative of the local community. Ideally, the link person has undergone training in participatory methods and tools and is a member of the PRA/PLA-team him/herself. - helps to prevent misunderstandings, and gives support to members of the PR|A/PLA team and the local community. - supports the PRA/PLA-team in planning activities by inputting her/his knowledge about the local situation. Refer back to the to the recommendation to "deal with uncomfortable feelings immediately" in the "Working on tasks in a team" presentation. Point out that in the team-working situation it is not unusual for someone to feel hurt, upset or misinterpreted by other team-members. Emphasise that this is quite normal and it does not have to disturb the teamwork process, as long as all persons involved are open with each other. Once there is a positive atmosphere in which persons can talk to each other and clarify misunderstandings, negative feelings will not tend to arise. For many people, however, it is quite difficult to talk about their feelings or the behaviour of others. Introduce the feedback-rules (see below) as "helpers". Giving feedback can be an important tool to prevent tensions within a team from growing into conflicts. If people deal with uncomfortable feelings quickly and inform each other of any disagreement with others behaviour then potential problems are more likely to be solved immediately. watch the other person carefully and try to make sure, that you are not upsetting him/her. give personal messages, so called "I-messages". In other words, make it clear that what you say is just your personal opinion. Start your statements with "I have the impression that..." or "It seems to me, as if..."
avoid statements like "you always do...". Refer instead to concrete situations, such "when you were talking about xy, you did..."
try to avoid adjectives which have a strong negative connotation, like "bad", "aggressive", "wrong", "stupid" as they will probably hurt the feelings of the other person and thus distract attention or create a defensive reaction. Rather talk about effects on yourself, e.g. instead of saying "The way you talk to me is very bad and aggressive" you could say " My feeling is that there is a lot of tension in our way of interacting - lets think about why this is so, and how we might change it"
adapt your feedback to the personality of the other. For example, a very self-confident person may need firmer words and clearer messages while a person who is already very critical and unsure about him/herself, might feel attacked if you come up with very strong comments. It can be a helpful exercise to do a group feedback exercise everyday during the training after the afternoon-break. In this way trainees can practice the feedback rules in relaxed situations, before they have to apply them in public. Example Chart for Group Exercise on "Roles in a team"
This session introduces PRA/PLA tools as well as other techniques which can be applied to support participatory processes and workshops. This session is made up of a collection of tools and methods. You will need to choose which ones are appropriate to the working and living context of your participants. You will also need to decide at which stage of your training workshop you will introduce them. Our experience has shown that the training process is much more stimulating for participants, if you introduce of at least one PRA/PLA tool into each training session from the very beginning. Trainees enjoy the application of tools, as it is something concrete which instantly gives a sense of how participatory approaches can be applied on the ground. In the Resource Box below, we have not mentioned walking exercises like transect or village walks, as they do not make sense in a nomadic pastoral context with groups who may move several hundred kilometres in a year. Larger scale mapping of regions and grazing areas may, however, be applicable. PRA/PLA Tools were created in order to ease common working and communication processes and to adapt abstract analysis and research processes to the needs of those working at the local or grass-roots level (see session 1: brief history). It is important to keep this background in mind. PRA-Tools should be looked upon as just tools. Many facilitators tend to use these tools too mechanically. They push participants to apply a tool in the same way and the same sequence or predefined steps. This mechanical application of tools is especially common among inexperienced facilitators who may feel safer following a set procedure when facilitating a process over which he/she does not yet have full mastery. However, as soon as one feels more comfortable with facilitation, one should concentrate on becoming as flexible as possible, allowing and proposing deviations, additional contents or even completely changing approaches, if they serve the goals that the respective group wants to achieve. A similar approach should be applied to the combination of tools. Participatory workshops very often consist of the same combination of tools, which are implemented in a set sequences, e.g. Village Walk, Mapping, Diagrams, Ranking. Here, again, this may be excusable for newcomers in facilitation or it may make sense, if the workshops are designed to serve similar objectives. However, the regular procedure should be that the decision about which tools to apply and in which sequence, is taken only after considering the objectives and the people they have to serve..
Maps are important means to illustrate resources, socio-economic features, movements and outside contacts of local groups or communities. They can provide an overview of an area, show the local situation as perceived by different interest groups, and provide a good starting point for discussions with local people about their problems, potentials and needs. Participatory training should provide an opportunity for participants to become familiar with different mapping techniques and to learn about the potential of maps to help analyse complex situations. In the following, we describe some of the most important mapping tools. It is recommended that facilitators provide an overview on the different kinds of mappings and their objectives, before introducing them one by one (social, physical, infrastructural, institutional/relational, etc). This can help avoid confusion amongst trainees concerning the purposes and focuses of the different mappings. Contrary to mappings in settled rural communities, mappings with mobile groups mostly cover a much wider range of area/space. This reflects the living conditions of such groups and the contexts of their lives. 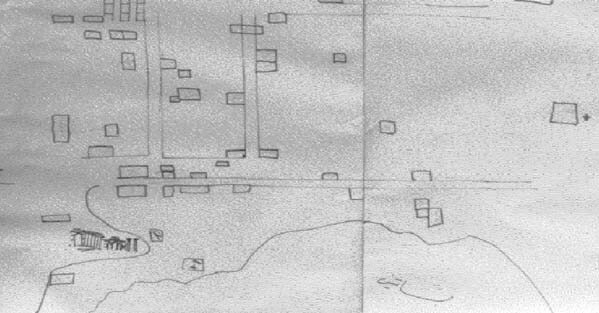 Small scale detailed drawings and sketches, such as a village walk, are unlikely to be of much use. However large-scale drawings representing the extensive land they traverse are likely to be more effective. Also landscape drawings and natural resource mapping is likely to be quite detailed. Two of the maps were drawn on the floor using paper and coloured markers, while two of the maps were drawn outside the room on tables using paper and markers. 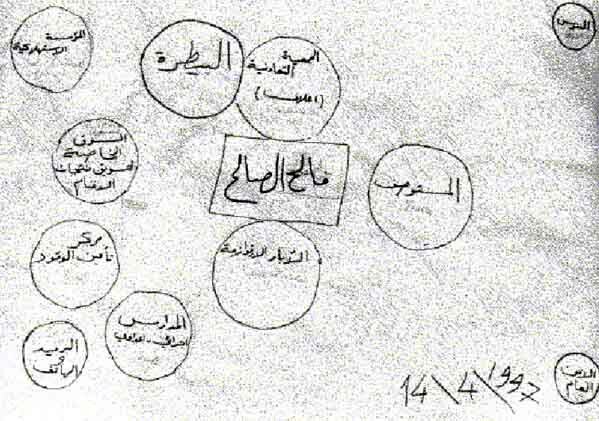 The map of the services in Palmyra was drawn in great detail and showed an intimate knowledge of the government and private services available in this rapidly growing town of 45,000 people. The map of the natural resources in the badia showed a fairly rich variety of the plants and shrubs, and a few of the water and other resources. The migration map of the badia gave a fairly general, broad picture of the major tribal movements during the eastern (winter) and western (summer) migrations. The group working on the map of the institutions/services of a Bedouin family had some initial difficulties and required additional help and support in conceptualising the mapping exercise. After the training sessions, and in order to practice mapping, the participants of the Palmyra training workshop visited Bedouin families, who voluntarily had agreed to serve as "test entities". The workshop participants were divided into four groups with each of the extension officers in a separate group and the rest of the participants divided up amongst them. The groups were instructed to use this time to informally interview the Bedouin families about their needs and their local knowledge of the environment, to conduct an informal mapping exercise of natural resources in the area, migratory range of the household, services available to the family and, institutions that are important to the unit. If time allowed the group was to attempt a matrix scoring of the most important shrubs and plants for the familys livestock. Three groups presented maps which their hosts had attempted. These exercises seemed to show that the Bedouin had a good general knowledge of the natural resources in the regions as well as the government and private services available locally. The mapping of migration routes for summer and winter movement of sheep and camels was more detailed than any of the class room exercises - but that was to be expected. The Resource Map is a good tool to with which to begin with. It is easy and fun for local people to do. It helps initiate discussion amongst the group members themselves and with the PRA/PLA-team. Apart from starting a joint process of information gathering and analysis, the Resource Mapping is also a helpful tool to make outsiders familiar with the people and their area, because it provides an overall orientation to the features of the group and its resources. 3. ask participants to draw a map of the area they are living in, showing all important items (according to their perception), such as natural resources, buildings, infrastructure etc. 8. then start asking questions like: "which of the things we can see on this map are helpful for you" - "which ones are bothering you" - "to whom belongs this" - "who decides how to use this and that resource" - "where are the problems in your area" etc. 9. after having discussed the characteristics of the area and the actual conditions of living there, ask people to show you, how they would like it to look like after 5 years, what could be donel to reach such a situation, who would be the persons/groups to decide upon and enhance such changes. 10. make sure to note down carefully all important points of discussion and any other additional information. 11. dont forget to draw a copy of the map before leaving - insert the legend and cardinal points (ie.North, South, East, West). Callens/Seiffert/Sontheimer: "Conducting a PRA Training and Modifying PRA Tools to Your Needs. An Example from a Participatory Household Food Security and Nutrition Project in Ethiopia." A mobility map is a map which shows patterns of spatial mobility for different groups within an area/community subgroups. - to which sources of information do the outside contacts draw. Make sure you adapt your questions and the outline of the mobility mapping according to the group you are working with. 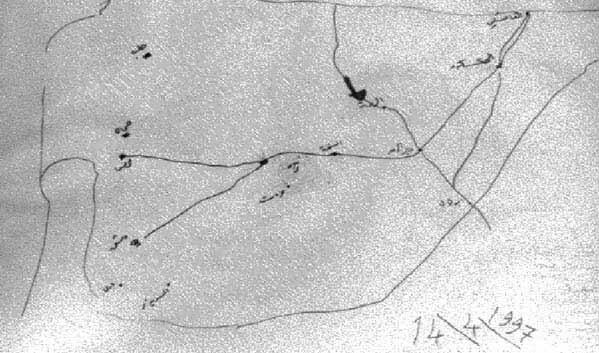 Bedouins will - obviously - have completely different habits, destinations and purposes of spatial moving than e.g. settled farmers. E.g. a settled farmers mobility map will rather show their home in the centre with moving destinations surrounding them, while Bedouins maps might develop in a spiral form originating from the centre and moving on from destination to destination. 1. explain to participants that you would like to understand their local pattern of movement, the destinations they frequent, and the purposes of their movements. 2. find out about one area, where they usually spend more time than in other regions and mark this in the centre of the drawing. 3. ask participants to name all important places they usually visit/move to within one year. 4. encourage them to draw these places in relation to the centre one. 5. then ask about the purposes for which they move and invite them to choose symbols for these purposes and indicate them on their map. 6. ask them to connect the different destinations with lines and to indicate the frequency of moving to the respective areas by the thickness of the connecting line. Diagramming is a way of structuring information clearly, visualising linkages between certain subjects or factors, and providing a basis for further analysis. Diagrams can be tables, trees, pie charts, or any other form appropriate to support the discussion of a particular topic. In the following, you find the two most common and very helpful PRA/PLA diagramming tools: the Flow Diagram and the Relationship or Venn Diagram. Try to include both into any training on participatory tools, as they are vital for problem analysis and the identification of social interaction patterns/sources of conflict. A Flow Diagram is a very important analytical tool which can be applied flexibly in different contexts. When analysing problems, a Flow Diagram shows a key problem in the centre of a drawing, its causes at the bottom and its effects on the top. · to identify entry point for solutions and to discuss, which solutions can be implemented autonomously by the local people, which ones require external assistance to be resolved, and for which ones there are no solutions at all (e.g. natural disasters, such as drought), but just a softening of effects. 5. have the key problem written/symbolised in the centre of your illustration or diagram. A Relationship Diagram shows institutions, organisations, groups, individuals, as well as their importance and co-operationality as perceived by for the people. - which institutions/organisations do local people know? What impression do local people have of these institutions? - how good is the contact/co-operation between these institutions and local people? - how important/effective is the support of such institutions for the local people? - how do the local people see existing groups/important persons amongst themselves what are the contacts/relationships like between different groups amongst local people? - how strong do these groups/persons influence local decision making? If you have a feeling that it is difficult for the people to understand this tool, give a simple example by drawing e.g. a Relationship Diagram showing a family and institutions important for them, such as e.g. school, hospital, working place, nursery, shops, sport club etc. The prioritisation and decision-making processes about various subjects and - problems, potentials, needs, wishes, constraints, solutions, project ideas - are an integral part of most participatory processes. Training participants have to become familiar with ways of facilitating such exercises. Simple Ranking (voting) serves to facilitate priority setting and decision making. It can be used with large groups of people and is less time-consuming than other ranking and scoring tools. One of the sessions was dedicated to a simple ranking game. Eight volunteers were called for. One participant was asked to go out of the room while another volunteer ranked the six remaining participants (arranged according to a criterion decided upon by him/her). The volunteer outside in the hall was then asked to come in and try to identify the criterion for ranking. This simple exercise paved the way for a brief explanation of matrix ranking and scoring. A group exercise on food preference was then conducted as a concrete example of how to do a scoring exercise. Time was very short and this exercise did not get the attention it deserved. Nevertheless, the groups seemed to understand the principles involved, although they requested more exercises to consolidate their new knowledge. They were then divided into four groups to attempt a ranking exercise of the relative value of shrubs and plants in the badia. Their findings were reviewed briefly by the whole of the workshop group. Three of the groups presented a matrix on relative value of shrubs and plants. Their findings had a basic similarity, in that one plant (local name: sheeh) scored highly in all three matrices even though the criteria for each chart was not always comparable. The findings taken from the chart drawn up by the one female-headed household head was particularly interesting to some of the group. The responses were very similar to those of the male respondents preferring Sheeh, Yantoon, Qaysoon and then Harmel. The common understanding among the Ministry of Agriculture and the Co-operatives is that Bedouin women do not know about the natural resources, or at least are never asked. In general the plant preferences which emerged from the field study had a number of similarities with the classroom exercise, but the order of preferences were different. It is the understanding of the trainers that these preliminary field findings validate the projects CTA efforts to change the type of plants and shrubs being used for the reseeding and replanting programme. Matrix Scoring is a tool by which certain issues are ranked against a list of criteria agreed upon by consensus within a group. - which of the items under discussion are prioritised by different groups of the local people? - how do people rank these criteria? - how different are the preferences and perceptions between different groups (e.g. men - women) within the local context? 5. make sure that all criteria you are listing, are (according to the options to be prioritised) formulated from the same perspective - either positive or negative, otherwise, the quotes will reflect an incorrect basic assumption. Pairwise Ranking or Preference Ranking is a tool to set priorities between different options available. In Pairwise Ranking, each individual item is compared directly against the others so as to emerge with a ranking from highest (best) to lowest (least). The problem of protecting the range was viewed as the first priority, protecting the reserve the second, lack of target group awareness of the projects activities third, shortage of workers fourth, ineffectiveness of the trench around the wildlife reserve fifth, and last, understaffing of the project. 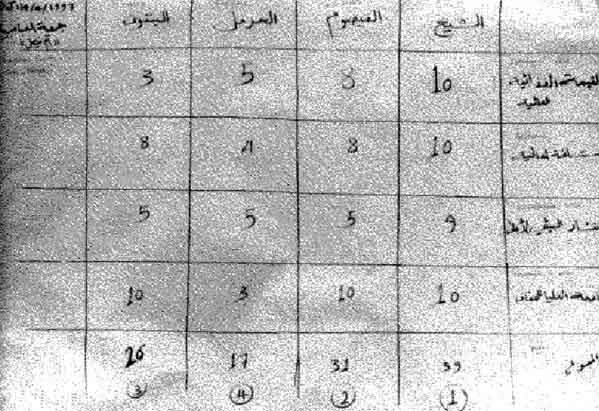 These options were then exposed to a pair-wise ranking exercise in order to rank them by importance to the Bedouin. The exercise was not successful for a number of reasons. First the participants were unable to think like Bedouin and consistently ranked the criteria by their own standards. Secondly, many of the options were too abstract and the participants could not conceptualize the issue. More time should have been taken to establish options that was grounded in reality, or one actual range area. Finally, and most importantly, the options were of incompatible levels of generalizations. The first option represented a complex system of management activity, while all the others were single strategies. Although the exercise was not successful, the lessons learned from it were very useful to the workshop. 1. beginning by writing out the names of members of a community on cards. One name per card, or one household per card. 2. The informant is asked to look at names on the cards and to identify which one is the best off, which one the least well off. 3. This process is continued until all the cards have been identified. 4. The process can be continued with each of the three groups of cards that you now have - best off, middle, and worst off. 5. The informant now has to be asked to explain what criteria was used to make these distinction. Once the criteria has been made clear, the team can go back and cross-check the information, asking whether the criteria fits for all the ranked cards. After a brief theoretical review of the concepts behind wealth ranking or standard of living stratification, the trainers conducted a pre-prepared role-playing example using 7 people known to the participants but not members of the local community in a wealth ranking exercise. This exercise tried to emphasis the need to identify the criteria being used by the informants - though at times it is necessary to lead with a few suggestions. This activity was then followed by the application of wealth ranking to all the listed members of the 3 different cooperatives. Using the government supervisors of each of the cooperatives as resource people, the group split into three and conducted this activity. Each team of 3 was reminded that the exercise required each team member to take on an active role, in this case as a facilitator, a note keeper and a time keeper. The work of the team, as a whole, was shown to be important for the success or failure of the group work. The session ended with an explanation of how to bring the differing number of categories of each group - one had three levels of stratification, another four and one five - into some kind of statistically comparable basis. SWOT (Strengths, Weaknesses, Opportunities, Threats) is an effective tool for self-evaluation and assessing future potentials. In the context of complex situations, it helps to identify and extract those issues, that have the strongest impact. The session on the SWOT analysis began with a general introduction of this tool as a strategy for finding solutions to problems. Taking a fictional example developed by one of the trainers, the workshop split into small working groups to analyse the potential strategies for solving identified problems. All groups looked at the problem of protecting the Wildlife Reserve. Two groups chose to look at the launching of an awareness campaign about Wildlife in Taliila as a potential solution to the problem. One group chose to look at the possibility of introducing more legislation to protect the reserve. Each group worked out its strategy and analysed potential strengths and weaknesses of the idea using a grid (S.W.O.T.) of internal and external strengths and weaknesses introduced by the trainers. These findings were then presented to the plenary and commented on by the trainers. The group divided into three working units to discuss these topics in depth and to try to find solutions. After each group carried out an in-depth analysis, the findings were put forward to a plenary session. The group working on guarding and reseeding came to the conclusions that providing guards should be possible through the co-operatives, but they did not go into great enough depth to identify what are the current constraints on present hiring efforts. This same group also considered the possibility of seed collection as an income generating project. The group considering the issue of access to the Taliila well went into greater detail in its analysis and recommended that access to the Taliila well be from outside the reserve (by setting up a system of pipes). The group considering the question of eco-tourism at Taliila also made a detailed analysis of the pros and cons of this possibility. They found that the difficulties that might exist could be easily overcome and recommended that this possibility be considered further. A Semi-Structured Interview or Informal Interview is an informative and relaxed dialogue, which helps to find out information. It is a participatory tool that can be applied in a very flexible manner. It is partly guided by the interviewer in order to find out information on pre-elaborated topics. It is partly a casual discussion in which new aspects of a certain topic arise or even new questions come up. It can be conducted with individuals or groups. · to identify convenient time periods for meetings, training etc. This session deals with the need to be flexible in the application of participatory tools. It also aims to encourage participants to be more willing to manipulate and change "real PRA-tools". but let the tool work for you. For the debriefing, ask the participants what happened to the tool - let them describe the different stages. Encourage them to use the terms "transferring, adapting, creating". Ask them for the advantages of these changes and invite them to think and talk about what this could mean in the context of PRA -tools. Make a short presentation on the importance of flexible application of tools (see below). Encouraging your trainees to see PRA-tools as simple helpers and not as something unchangeable. Remind your trainees the first tools were created by practitioners like themselves. Show them examples of adapted and newly created tools for certain contexts (see Background Materials). Good facilitators should be able to adapt, and create new tools which suit the goals and special context of their participants. Using tools in a new context is not necessarily an adaptation of a pre-existing form. Adaptation means to change existing tools to make them more suitable for a particular task. Such tailor-made tools are often more inspiring than "standard" tools. It is important, therefore, to train participants in sound PRA tool application and, at the same time, to encourage creativity among new facilitators. In this way they well be encouraged to adapt and create their own tools, be it for a workshop or spontaneously in some other setting. Divide participants into small groups. Give to each group the following tasks: Firstly describe a fictive workshop-situation, a pre-formulated key-issue and a PRA-tool to be adapted to the respective situation. Secondly provide another description and key-issue and ask them to develop a tool for this situation without using any of the well-known PRA-tools. This is not one of the classical PRA/PLA tools. It is a tool that has been created by the facilitators of a field team for supporting an analysis with a womens group. They combined the initial letters of their names (Cecilia Chimbala and Christiane Beck) to name the tool. This example of a simple tool created when other tools were not suitable to the requirements shows that there is no need to fear walking onto new ground and making a tool on your own. The Chrice Matrix is an analytical tool for looking at previous efforts of problem-solving and drawing conclusions for future activities. It deepens awareness of possible constraints for a project idea. The lessons learned from it should influence the planning of new projects, tackling the same problem. In addition, it provides a historical overview of the village/community. In participatory approaches, PRA tools are usually combined with other tools in order to reach a certain goal. This session introduces the classic PRA workshop approach, but it also encourages trainees to be creative and modify these suggestions for combining tools. Each workshop context is different. In most cases were PRA is being applied, it is useful to combine a number of tools in order to facilitate a participatory process towards a particular goal. It may be in order to improve income for a group of women or enhance the infrastructure of an entire community. The classic PRA workshop pulls together a combination of different tools which, step by step, support a process of analysis. The actual set of tools used will vary with the specific context of the workshop and goals which have been set out. A PRA workshop is an analysis and planning event, which usually lasts between 3 and 6 days It is commonly facilitated by an interdisciplinary team of 8-10 persons trained for this purpose. Such a workshop follows logical steps applying participatory tools with a certain but limited flexibility. It provides the opportunity to all participants to work together intensely. Often it results in a positive and enthusiastic atmosphere with a strong empowering effect. On the other hand side, it is very time- consuming and costly for the parties involved. It also holds the risk of raising high expectations which can not often be fulfilled. identifying which problems to work towards solving ensuring that the community and the project cooperate as partners. (If your trainees don't know these terms, explain briefly, that key-issues are the major topics or problems which need to be discussed or analysed during the workshop. Key-questions help the group to become aware of the primary data or information, which needs to be generated in order to reach workshop goal). - decide which tools are adequate to discuss/analyse/answer these key-issues and key-questions. Keep in mind that one tool can serve to work on different key-issues/questions. - put the tools in an order which makes sense in terms of progressive analysis (from general to special). Reiterate the fact that a participatory workshop (may it be 4 days or one afternoon session) is a complex event, which needs careful planning in order to reach its' objectives. - elaboration of a tentative workshop programme. Then choose an example from the work of the participants and let them plan for a workshop. Support them in the process - especially in the formulation of objectives (purposes and outcomes) which can be difficult for trainees to grasp clearly. Participation adds the most value to conventional approaches when it is designed and planned as a process. The participation of people in a single one-off event may have some benefits in that it better informs them about what is going on. Single events, however, have only limited impact in terms of mobilising people to interact, plan and implement their own development. When we consider participation in Natural Resource Management we must take a long term perspective. We are looking at a long-term a process of interaction between different people - with different interests - and their natural environment. This session outlines the features and sequence of a participatory learning and action cycle. How can participation be designed as process? A. Brainstorming: Terms "project cycle" and "iterative"
Let participants describe what they know about or think ofwhen they hear the term "project cycle"
· Invite participants to explain the term "iterative". In case they cant, be prepared to introduce it yourself. You may wish to introduce the concept of "iterative" by using the simple adult learning cycle described by Kolb, which shows that learning is an ongoing constant process, which is circular in nature. · Relate the iterative learning to the project cycle and levels of participation. Testing means application of new working mode. What has participation to do with iterative learning and the project cycle? Participatory learning goes along with the iterative implementation of the project cycle. It is a process whereby people are mobilised (social mobilisation) and included in the project. They are given an active role in the design, re-design and decision making in all stages of a project cycle.